Not to be confused with Astrological symbols. This excerpt from the 1833 Nautical Almanac demonstrates the use of astronomical symbols, including symbols for the phases of the moon, the planets, and zodiacal constellations. Astronomical symbols are abstract pictorial symbols used to represent astronomical objects, theoretical constructs and observational events in European astronomy. The earliest forms of these symbols appear in Greek papyrus texts of late antiquity. The Byzantine codices in which many Greek papyrus texts were preserved continued and extended the inventory of astronomical symbols. New symbols were further invented to represent many newly-discovered planets and minor planets discovered in the 18th to the 20th centuries. These symbols were once commonly used by professional astronomers, amateur astronomers, alchemists, and astrologers. While they are still commonly used in almanacs and astrological publications, their occurrence in published research and texts on astronomy is relatively infrequent, with some exceptions such as the Sun and Earth symbols appearing in astronomical constants, and certain zodiacal signs used to represent the solstices and equinoxes. Unicode has formally assigned code points to most symbols, mainly in the Miscellaneous Symbols Block and the Miscellaneous Symbols and Pictographs Block.
) for the Sun and a crescent for the Moon. The modern Sun symbol, a circle with a dot (☉), first appeared in Europe in the Renaissance. In modern academic usage, the Sun symbol is used for astronomical constants relating to the Sun. Teff☉ represents the solar effective temperature, and the luminosity, mass, and radius of stars are often represented using the corresponding solar constants (L☉, M☉, and R☉, respectively) as units of measurement. (dec 127774) 🌞︎ the face of the Sun or "Sun in splendor"
Medieval depiction of the zodiac and the classical planets. The planets are represented by seven faces. Symbols for the classical planets appear in many medieval Byzantine codices in which many ancient horoscopes were preserved. The written symbols for Mercury, Venus, Jupiter, and Saturn have been traced to forms found in late Greek papyrus texts. The symbols for Jupiter and Saturn are identified as monograms of the corresponding Greek names, and the symbol for Mercury is a stylized caduceus. According to A. S. D. Maunder, antecedents of the planetary symbols were used in art to represent the gods associated with the classical planets; Bianchini's planisphere, produced in the 2nd century, shows Greek personifications of planetary gods charged with early versions of the planetary symbols: Mercury has a caduceus; Venus has, attached to her necklace, a cord connected to another necklace; Mars, a spear; Jupiter, a staff; Saturn, a scythe; the Sun, a circlet with rays radiating from it; and the Moon, a headdress with a crescent attached. 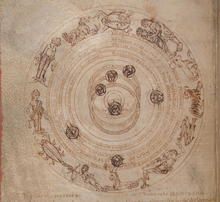 A diagram in Byzantine astronomer Johannes Kamateros's 12th century Compendium of Astrology shows the Sun represented by the circle with a ray, Jupiter by the letter zeta (the initial of Zeus, Jupiter's counterpart in Greek mythology), Mars by a shield crossed by a spear, and the remaining classical planets by symbols resembling the modern ones, without the cross-mark seen in modern versions of the symbols. These cross-marks first appear around the 16th century. According to Maunder, the addition of crosses appears to be "an attempt to give a savour of Christianity to the symbols of the old pagan gods." , was suggested by Lalande in 1784. In a letter to Herschel, Lalande described it as "un globe surmonté par la première lettre de votre nom" ("a globe surmounted by the first letter of your name"). ). However, this suggestion met with stiff resistance outside France. French almanacs quickly reintroduced the name Herschel for Uranus, after that planet's discoverer Sir William Herschel, and Leverrier for the new planet. Professor James Pillans of the University of Edinburgh defended the name Janus for the new planet, and proposed a key for its symbol. Meanwhile, German-Russian astronomer Friedrich Georg Wilhelm von Struve presented the name Neptune on December 29, 1846, to the Saint Petersburg Academy of Sciences. In August 1847, the Bureau des Longitudes announced its decision to follow prevailing astronomical practice and adopt the choice of Neptune, with Arago refraining from participating in this decision. The International Astronomical Union discourages the use of these symbols in journal articles. In certain cases where planetary symbols might be used, such as in the headings of tables, the IAU Style Manual permits certain one- and (to disambiguate Mercury and Mars) two-letter abbreviations for the names of the planets. Following the discovery of Ceres in 1801 by the astronomer and Catholic priest Giuseppe Piazzi, a group of astronomers ratified the name, which Piazzi had proposed. At that time, the sickle was chosen as a symbol of the planet. The symbol for 2 Pallas, the spear of Pallas Athena, was invented by Baron Franz Xaver von Zach, who organized a group of twenty-four astronomers to search for a planet between the orbits of Mars and Jupiter. The symbol was introduced by von Zach in his Monatliche correspondenz zur beförderung der erd- und himmels-kunde. In a letter to von Zach, discoverer Heinrich Wilhelm Matthäus Olbers (who had named the newly discovered asteroid) expressed his approval of the proposed symbol, but wished that the handle of the sickle of Ceres had been adorned with a pommel instead of a crossbar, to better differentiate it from the sign of Venus. German astronomer Karl Ludwig Harding created the symbol for 3 Juno. Harding, who discovered this asteroid in 1804, proposed the name Juno and the use of a scepter topped with a star as its astronomical symbol. Karl Ludwig Hencke, a German amateur astronomer, discovered the next two asteroids, 5 Astraea (in 1845) and 6 Hebe (in 1847). Hencke requested that the symbol for 5 Astraea be an upside-down anchor; however, a pair of balances was sometimes used instead. Gauss named 6 Hebe at Hencke's request, and chose a wineglass as the symbol. As more new asteroids were discovered, astronomers continued to assign symbols to them. Thus, 7 Iris had for its symbol a rainbow with a star; 8 Flora, a flower; 9 Metis, an eye with a star; 10 Hygiea, an upright snake with a star on its head; 11 Parthenope, a standing fish with a star; 12 Victoria, a star topped with a branch of laurel; 13 Egeria, a buckler; 14 Irene, a dove carrying an olive branch with a star on its head; 15 Eunomia, a heart topped with a star; 16 Psyche, a butterfly wing with a star; 17 Thetis, a dolphin with a star; 18 Melpomene, a dagger over a star; and 19 Fortuna, a star over Fortuna's wheel. Johann Franz Encke made a major change in the Berliner Astronomisches Jahrbuch (BAJ, Berlin Astronomical Yearbook) for the year 1854, published in 1851. He introduced encircled numbers instead of symbols, although his numbering began with Astraea, the first four asteroids continuing to be denoted by their traditional symbols. This symbolic innovation was adopted very quickly by the astronomical community. The following year (1852), Astraea's number was bumped up to 5, but Ceres through Vesta would be listed by their numbers only in the 1867 edition. The circle later became a pair of parentheses, and the parentheses were sometimes omitted altogether over the next few decades. A few asteroids were given symbols by their discoverers after the encircled-number notation became widespread. 26 Proserpina, 28 Bellona, 35 Leukothea, and 37 Fides, all discovered by German astronomer Robert Luther between 1853 and 1855, were assigned, respectively, a pomegranate with a star inside; a whip and spear; an antique lighthouse; and a cross. 29 Amphitrite was named and assigned a shell for its symbol by George Bishop, the owner of the observatory where astronomer Albert Marth discovered it in 1854. Pluto's name and symbol were announced by the discoverers on May 1, 1930. The symbol, a monogram of the letters PL, could be interpreted to stand for Pluto or for Percival Lowell, the astronomer who initiated Lowell Observatory's search for a planet beyond the orbit of Neptune. The zodiac symbols have several astronomical interpretations. Depending on context, a zodiac symbol may denote either a constellation, or a point or interval on the ecliptic plane. Lists of astronomical phenomena published by almanacs sometimes included conjunctions of stars and planets or the Moon; rather than print the full name of the star, a Greek letter and the symbol for the constellation of the star was sometimes used instead. The ecliptic was sometimes divided into 12 signs, each subdivided into 30 degrees, and the sign component of ecliptic longitude was expressed either with a number from 0 to 11 or with the corresponding zodiac symbol. In modern academic usage, all the constellations, including the twelve of the zodiac, have dedicated three-letter abbreviations. The zodiac symbols are also sometimes used to represent points on the ecliptic, particularly the solstices and equinoxes. Each symbol is taken to represent the "first point" of each sign. Thus, ♈︎ the symbol for Aries, represents the March equinox; ♋︎, for Cancer, the June solstice; ♎︎, for Libra, the September equinox; and ♑︎, for Capricorn, the December solstice. Symbols for aspects and nodes appear in medieval texts, although medieval and modern usage of the node symbols differ; the modern ascending node symbol (☊) formerly stood for the descending node, and the modern descending node symbol (☋) was used for the ascending node. In describing the Keplerian elements of an orbit, ☊ is sometimes used to denote the ecliptic longitude of the ascending node, although it is more common to use Ω (capital omega), which was originally a typographical substitute for the astronomical symbol. The symbols for aspects first appear in Byzantine codices. Of the symbols for the five Ptolemaic aspects, only the three displayed here—for conjunction, opposition, and quadrature—are used in astronomy. for the star of comparison relative to which measurements of the comet's position were made. 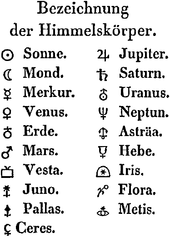 Wikimedia Commons has media related to Astronomical symbols. ^ a b Neugebauer, Otto (1975). A history of ancient mathematical astronomy. pp. 788–789. ISBN 978-0-387-06995-1. ^ a b c d e f Neugebauer, Otto; Van Hoesen, H. B. (1987). Greek Horoscopes. pp. 1, 159, 163. ISBN 978-0-8357-0314-7. ^ Pasko, Wesley Washington (1894). American dictionary of printing and bookmaking. p. 29. ^ a b c d e f g h i j k l m n "Miscellaneous Symbols" (PDF). unicode.org. The Unicode Consortium. 2018. Retrieved November 5, 2018. ^ "Miscellaneous Symbols and Pictographs" (PDF). unicode.org. The Unicode Consortium. 2018. Retrieved November 5, 2018. ^ Green, Simon F.; Jones, Mark H.; Burnell, S. Jocelyn (2004). An introduction to the sun and stars. Cambridge University Press. p. 8. ^ Goswami, Aruna (2010). Principles and Perspectives in Cosmochemistry: Lecture Notes of the Kodai School on 'Synthesis of Elements in Stars' Held at Kodaikanal Observatory, India, April 29 – May 13, 2008. pp. 4–5. ^ Gray, David F. (2005). The observation and analysis of stellar photospheres. Cambridge University Press. p. 505. ^ Salaris, Maurizio; Cassisi, Santi (2005). Evolution of stars and stellar populations. John Wiley and Sons. p. 351. ^ Tielens, A. G. G. M. (2005). The physics and chemistry of the interstellar medium. Cambridge University Press. p. xi. ^ a b c d e f g h i j k l m n o "Planet Symbols". NASA. Archived from the original on March 17, 2010. Retrieved March 4, 2010. ^ a b c d e f g h i j k l Cox, Arthur (2001). Allen's astrophysical quantities. Springer. p. 2. ISBN 978-0-387-95189-8. ^ a b c d e f g h i j k l m Hilton, James L. (June 14, 2011). "When Did the asteroids Become Minor Planets?". Archived from the original on August 10, 2018. Retrieved April 24, 2013. ^ a b c d e Frey, A. (1857). Nouveau manuel complet de typographie contenant les principes théoriques et pratiques de cet art. p. 379. ^ Éphémérides des mouvemens célestes. 1774. p. xxxiv. ^ a b c d e f The Penny cyclopædia of the Society for the Diffusion of Useful Knowledge. 22. C. Knight. 1842. p. 197. ^ a b c d e f g h i j k l m n The Encyclopedia Americana: a library of universal knowledge. 26. Encyclopedia Americana Corp. 1920. pp. 162–163. Retrieved March 24, 2011. ^ a b c d e f g h i Putnam, Edmund Whitman (1914). The essence of astronomy: things every one should know about the sun, moon, and stars. G.P. Putnam's sons. p. 197. ^ a b c d Almanach de Gotha. 158. 1852. p. ii. ^ a b c d (Firm), Hachette (1908). Almanach Hachette. p. 8. ^ a b Jones, Alexander (1999). Astronomical papyri from Oxyrhynchus. pp. 62–63. ISBN 978-0-87169-233-7. ^ "Bianchini's planisphere". Florence, Italy: Istituto e Museo di Storia della Scienza (Institute and Museum of the History of Science). Archived from the original on February 27, 2018. Retrieved August 20, 2018. ^ a b Maunder, A. S. D. (1934). "The origin of the symbols of the planets". The Observatory. 57: 238–247. Bibcode:1934Obs....57..238M. ^ a b c Bode, J. E. (1784). Von dem neu entdeckten Planeten. pp. 95–96. ^ a b c Gould, B. A. (1850). Report on the history of the discovery of Neptune. Smithsonian Institution. p. 5. ^ Cain, Fraser. "Symbol for Uranus". Universe Today. Archived from the original on January 3, 2017. Retrieved March 18, 2013. ^ a b Francisca Herschel (1917). "The meaning of the symbol H+o for the planet Uranus". The Observatory. 40: 306. Bibcode:1917Obs....40..306H. ^ a b Littmann, Mark; Standish, E. M. (2004). Planets Beyond: Discovering the Outer Solar System. Courier Dover Publications. p. 50. ISBN 978-0-486-43602-9. ^ a b Pillans, James (1847). "Ueber den Namen des neuen Planeten". Astronomische Nachrichten. 25 (26): 389–392. Bibcode:1847AN.....25..389.. doi:10.1002/asna.18470252602. ^ a b Baum, Richard; Sheehan, William (2003). In Search of Planet Vulcan: The Ghost in Newton's Clockwork Universe. Basic Books. pp. 109–110. ISBN 978-0-7382-0889-3. ^ a b c Schumacher, H. C. (1846). "Name des Neuen Planeten". Astronomische Nachrichten. 25 (6): 81–82. Bibcode:1846AN.....25...81L. doi:10.1002/asna.18470250603. ^ Gingerich, Owen (1958). "The Naming of Uranus and Neptune". Astronomical Society of the Pacific Leaflets. 8 (352): 9–15. Bibcode:1958ASPL....8....9G. Archived from the original on August 16, 2018 – via NASA Astrophysics Data System. ^ Hind, J. R. (1847). "Second report of proceedings in the Cambridge Observatory relating to the new Planet (Neptune)". Astronomische Nachrichten. 25 (21): 309–314. Bibcode:1847AN.....25..309.. doi:10.1002/asna.18470252102. ^ Bureau Des Longitudes, France (1847). Connaissance des temps: ou des mouvementes célestes, à l'usage des astronomes. p. unnumbered front matter. ^ a b c d e f g h i j k l m The IAU Style Manual (PDF). 1989. p. 27. Archived (PDF) from the original on June 21, 2018. Retrieved August 20, 2018. ^ a b c d e f g h i j k l m n o p q r s t u v Mattison, Hiram (1872). High-School Astronomy. Sheldon & Co. pp. 32–36. ^ "Signs of the Planets". Universe Today. August 6, 2009. Archived from the original on June 3, 2010. Retrieved March 8, 2010. ^ Bode, J. E., ed. (1801). Berliner astronomisches Jahrbuch führ das Jahr 1804. pp. 97–98. ^ a b c d von Zach, Franz Xaver (1802). Monatliche correspondenz zur beförderung der erd- und himmels-kunde, Volume 6. pp. 95–96. ^ a b c von Zach, Franz Xaver (1804). Monatliche correspondenz zur beförderung der erd- und himmels-kunde. 10. p. 471. ^ a b c von Zach, Franz Xaver (1807). Monatliche correspondenz zur beförderung der erd- und himmels-kunde. 15. p. 507. ^ a b Faulks, David (May 9, 2006). "Proposal to add some Western Astrology Symbols to the UCS" (PDF). p. 4. Archived (PDF) from the original on June 15, 2018. Retrieved November 20, 2017. In general, only the signs for Vesta have enough variance to be regarded as different designs. However, all of these Vesta symbols ... are differing designs for 'the hearth and flame of the temple of the Goddess Vesta' in Rome, and can thus be regarded as extreme variants of a single symbol. ^ a b c Berlin, Deutsche Akademie der Wissenschaften zu; Berlin, KöNiglich Preussische Akademie der Wissenschaften zu (1845). Bericht über die zur Bekanntmachung geeigneten Verhandlungen der Königl. Preuss. Akademie der Wissenschaften zu Berlin. p. 406. Der Planet hat mit Einwilligung des Entdeckers den Namen Astraea erhalten, und sein Zeichen wird nach dem Wunsche des Hr. Hencke ein umgekehrter Anker sein. ^ a b c d e f g h i j k l Schmadel, Lutz D. (2003). Dictionary of minor planet names. Springer. pp. 15–18. ISBN 978-0-354-06174-2. ^ a b c Wöchentliche Unterhaltungen für Dilettanten und Freunde der Astronomie, Geographie und Witterungskunde. 1847. p. 315. ^ Steger, Franz (1847). Ergänzungs-conversationslexikon. 3. p. 442. Hofrath Gauß gab auf Hencke's Ansuchen diesem neuen Planetoiden den Namen Hebe mit dem Zeichen (ein Weinglas). ^ a b c d e "Report of the Council to the Twenty-eighth Annual General Meeting". Monthly Notices of the Royal Astronomical Society. 8: 82. 1848. Bibcode:1848MNRAS...8...82.. doi:10.1093/mnras/8.4.82 (inactive September 7, 2018). The symbol adopted for [Iris] is a semicircle to represent the rainbow, with an interior star and a base line for the horizon....The symbol adopted for [Flora's] designation is the figure of a flower. ^ a b "Extract of a Letter from Mr. Graham". Monthly Notices of the Royal Astronomical Society. 8: 147. 1848. I trust, therefore, that astronomers will adopt this name [viz. Metis], with an eye and star for symbol. ^ a b c d e f de Gasparis, Annibale (1850). "Letter to Mr. Hind, from Professor Annibale de Gasparis". Monthly Notices of the Royal Astronomical Society. 11: 1. Bibcode:1850MNRAS..11....1D. doi:10.1093/mnras/11.1.1a. The symbol of Hygeia is a serpent (like a Greek ζ) crowned with a star. That of Parthenope is a fish crowned with a star. ^ a b Hind (1850). "Letter from Mr. Hind". Monthly Notices of the Royal Astronomical Society. 11: 2. Bibcode:1850MNRAS..11....2H. doi:10.1093/mnras/11.1.2. I have called the new planet Victoria, for which I have devised, as a symbol, a star and laurel branch, emblematic of the Goddess of Victory. ^ a b (France), Académie des Sciences (1851). "Correspondance". Comptes Rendus des Séances de l'Académie des Sciences. 32: 224. M. De Gasparis adresse ses remerciments à l'Académie, qui lui a décerné, dans la séance solennelle du 16 décembre 1850, deux des médailles de la fondation Lalande, pour la découverte des planètes Hygie, Parthénope et Egérie. M. de Gasparis annonce qu'il a choisi, pour symbole de cette dernière planète, la figure d'un bouclier. ^ a b Hind (1851). "On the Discovery of a Fourth New Planet, at Mr. Bishop's Observatory, Regent's Park". Monthly Notices of the Royal Astronomical Society. 11 (8): 171. doi:10.1093/mnras/11.8.170a. Sir John Herschel, who kindly undertook the selection of a name for this, the fourteenth member of the ultra-zodiacal group, has suggested Irene as one suitable to the present time, the symbol to be a dove carrying an olive-branch with a star on the head; and since the announcement of this name, I have been gratified in receiving from all quarters the most unqualified expressions of approbation. ^ a b de Gasparis, Annibale (1851). "Beobachtungen und Elemente der Eunomia". Astronomische Nachrichten. 33 (11): 174. Bibcode:1851AN.....33..173D. doi:10.1002/asna.18520331107. J'ai proposé le nom Eunomia pour la nouvelle planète. Le symbole serait un coeur surmonté d'une étoile. ^ a b Sonntag, A. (1852). "Elemente und Ephemeride der Psyche". Astronomische Nachrichten. 34 (20): 283–286. Bibcode:1852AN.....34..283.. doi:10.1002/asna.18520342010. (in a footnote) Herr Professor de Gasparis schreibt mir, in Bezug auf den von ihm März 17 entdeckten neuen Planeten: "J'ai proposé, avec l'approbation de Mr. Hind, le nom de Psyché pour la nouvelle planète, ayant pour symbole une aile de papillon surmontée d'une étoile." ^ a b c Luther, R. (1852). "Beobachtungen der Thetis auf der Bilker Sternwarte". Astronomische Nachrichten. 34 (16): 243–244. doi:10.1002/asna.18520341606. Herr Director Argelander in Bonn, welcher der hiesigen Sternwarte schon seit längerer Zeit seinen Schutz und Beistand zu Theil werden lässt, hat die Entdeckung des April-Planeten zuerst constatirt und mir bei dieser Gelegenheit dafür den Namen Thetis und das Zeichen [symbol pictured] vorgeschlagen, wodurch der der silberfüssigen Göttinn geheiligte Delphin angedeutet wird. Indem ich mich hiermit einverstanden erkläre, ersuche ich die sämmtlichen Herren Astronomen, diesen Namen und dieses Zeichen annehmen und beibehalten zu wollen. ^ a b c d e f g h i j Hind, J. R. (1852). An astronomical vocabulary. pp. v.
^ a b c Luther, R. (1853). "Beobachtungen des neuesten Planeten auf der Bilker Sternwarte". Astronomische Nachrichten. 36 (24): 349–350. doi:10.1002/asna.18530362403. ^ a b c Encke, J. F. (1854). "Beobachtung der Bellona, nebst Nachrichten über die Bilker Sternwarte". Astronomische Nachrichten. 38 (9): 143–144. Bibcode:1854AN.....38..143.. doi:10.1002/asna.18540380907. ^ a b c Rümker, G. (1855). "Name und Zeichen des von Herrn R. Luther zu Bilk am 19. April entdeckten Planeten". Astronomische Nachrichten. 40 (24): 373–374. Bibcode:1855AN.....40Q.373L. doi:10.1002/asna.18550402405. ^ a b c Luther, R. (1856). "Schreiben des Herrn Dr. R. Luther, Directors der Sternwarte zu Bilk, an den Herausgeber". Astronomische Nachrichten. 42 (7): 107–108. Bibcode:1855AN.....42..107L. doi:10.1002/asna.18550420705. ^ a b Marth, A. (1854). "Elemente und Ephemeride des März 1 in London entdeckten Planeten Amphitrite". Astronomische Nachrichten. 38 (11): 167–168. Bibcode:1854AN.....38..167.. doi:10.1002/asna.18540381103. ^ Slipher, V. M. (1930). "The Trans-Neptunian planet". 38: 415. ^ Chambers, George Frederick (1877). A handbook of descriptive astronomy. Clarendon Press. pp. 920–921. ISBN 978-1-108-01475-5. ^ a b Olmsted, Dennis (1855). Letters on astronomy. Harper. p. 288. ^ a b c Wilson, John (1899). A treatise on English punctuation. p. 302. ISBN 978-1-4255-3642-8. ^ Hencke, Karl Ludwig (1847). "Schreiben des Herrn Hencke an den Herausgeber". Astronomische Nachrichten. 26 (610): 155–156. Bibcode:1847AN.....26..155H. doi:10.1002/asna.18480261007. ^ Austria: Oesterreichischer Universal-Kalender für das gemeine Jahr 1849. 1849. p. xxxix. ^ a b c d Webster, Noah; Goodrich, Chauncey Allen (1884). Webster's Complete Dictionary of the English Language. p. 1780. ^ Admiralty, T.H.E. Board O.F. (1831). The Nautical Almanac and Astronomical Ephemeris for the Year 1833. p. 1. ^ The American Almanac and Repository of Useful Knowledge, for the Year 1835. 1834. p. 47. ^ Encyclopædia Britannica, Edition 6. 3. 1823. p. 155. ...observe, that 60 seconds make a minute, 60 minutes make a degree, 30 degrees make a sign, and 12 signs make a circle. ^ a b c d e f g h i j k l m n o Joyce, Jeremiah (1866). Scientific dialogues for the instruction and entertainment of young people. p. 109. ISBN 978-1-145-49244-8. ^ The Nautical Almanac and the Astronomical Ephemeris for the year 1834. 1833. p. xiii. 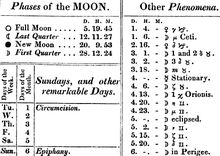 The 1834 edition of the Nautical Almanac and Astronomical Ephemeris abandoned the use of numerical signs (among other innovations); compare the representation of (ecliptic) longitude in the editions for the years 1834 and 1833. ^ The IAU Style Manual (PDF). 1989. p. 34. Archived (PDF) from the original on June 21, 2018. Retrieved August 20, 2018. ^ Roy, Archie E.; David, Clarke (2003). Astronomy: principles and practice. p. 73. ISBN 978-0-7503-0917-2. ^ King-Hele, Desmond (1992). A tapestry of orbits. p. 16. ISBN 978-0-521-39323-2. ^ a b c d e f g h i j k l Mattison, Hiram (1872). High-School Astronomy. Sheldon & Co. p. 52. Retrieved November 15, 2018. ^ Covington, Michael A. (2002). Celestial objects for modern telescopes. 2. pp. 77–78. ^ Ridpath, John Clark, ed. (1897). The standard American encyclopedia. 1. p. 198. ^ a b c Tupman, G. L. (1877). "Observations of Comet I 1877". Astronomische Nachrichten. 89 (11): 169–170. Bibcode:1877AN.....89..169T. doi:10.1002/asna.18770891103. Retrieved March 24, 2011.